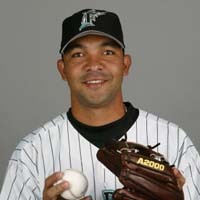 First of all, curses to you, Alex Gonzalez of the Marlins, for not having a middle name that would have made it easier to distinguish you from Alex Scott Gonzalez, formerly of the Devil Rays, Cubs, and Blue Jays. To make matters worse, you’re a free agent who has done nothing offensively for 2.5 seasons now, so the Marlins are unlikely to re-sign you, and we’ll have to find a new title for you. Maybe Alex Gonzalez of Venezuela. Wow. If you study that chart closely enough, you can see that Cesar had exactly zero RBIs between the end of May and the All-Star break. And the post-June batting average of .173 and slugging average of .222 kind of jump out at you. His baserunning did improve as the year went on, further associating himself with the Marlins’ Alex Gonzalez. In fact, this guy almost makes you wonder why we didn’t just wait until next year and call it the “Cesar Izturis Award,” thereby avoiding all of the confusion with the nomenclature. Well, if we did that, we wouldn’t be able to comment on something pretty special that took place across the country over in the American League. If you’re scoring at home, Brian Roberts hit eight (8) homers in April, then proceeded to bop just three (3) in 248 post-break at bats. He was also 10/11 in his April stolen base attempts, going a so-so 17-for-26 (65.4%) afterwards. His post-All-Star dropoff in both OBP and SLG was larger than Gonzalez’s in his fabled 2003 season. Congratulations Brian, you had a fine season, and now you have a fine award. Enjoy them; I don’t think you’ll ever have another one of either again. Yup, Lawton went from being the NL’s premier leadoff hitter in the first half to someone who couldn’t slug .300 in the second half, to someone who couldn’t hit his weight after the trade deadline. And although we do appreciate Matt’s keeping with the tradition of improving his running game as his other numbers decline, we cannot help but believe that this collapse was the direct result of a ‘roid crash. Steroid test results are not made public until months after the positive result, so although we learned just this fall that Lawton had tested positive for horse steroids, the actual test must have been done…oh, I don’t know… around the July 31st trade deadline? It is entirely possible that someone tipped off the Pirates (and later, Cubs) organizations as to the fact that Lawton had tested positive for steroids. Whether that’s true or not, the vogue thing to do is deny steroid users any potential awards, so why should ours be any different? Sorry Matt, you just get an honorable mention. But thanks for fading. Well, that’s all the mid-season collapsing we have time for this year. Stay tuned next year, when Baseball Evolution’s Alex Gonzalez of the Marlins Award (or something with a similar name) brings out its next wave of chokers.